The last two months of 2010 spotlighted three centers for differently-abled children: the inauguration of Shine Intervention Center in Pasig, the Atty. Jose Miguel T. Arroyo Developmental and Behavioral Studies Unit inside Philippine General Hospital; and the re-dedication of Quality Life Discoveries in Quezon City. Filipinos can be proud that all three centers have world-class facilities. For parent advocates, we are happy that families dealing with autism and other developmental disabilities now have more options. We are even happier that even the marginalized families can avail of these services through TheraPinoy. Let our Angel Talker this week explain new therapy options and TheraPinoy. She is Raina Stella Reyes, an occupational therapist who graduated from the College of Allied Medical Professions, University of the Philippines. She holds sessions in private centers such as the Quality Life Discoveries in Quezon City. Teacher Raina serves as adviser to the Occupational Therapy Students Assembly, the umbrella organization of OT student groups from various universities nationwide. If you are a parent or a family member of a child with autism, you must have typed the keywords “treatment for autism” in the Google search bar at least once. It is also certain that the minute you pressed “enter,’’ you were somewhat overwhelmed by the more than 10 million hits you received by just typing in those three words. If you narrow it down to only “pages from the Philippines”, you get 8,000 hits, which still does not make it any easier to select the best available course of action for your child. The things we know about autism have greatly evolved since the diagnosis was first described in 1943. But a large amount of information still waits to be uncovered, specifically relating to what really causes these changes in our children. If you have ever spent an hour with a group of children with autism, you will realize that despite the similar diagnosis, each child is unique. Each has unique behaviors, weaknesses and strengths. Thus, it comes as no surprise that evidence for treatment options for children with autism has been so difficult to generate. The same can be said about services provided to other children with special needs, such as cerebral palsy. Back to basics: What is occupational therapy and how can it help your child? The World Federation of Occupational Therapy (2004) defines occupational therapy as a profession that is "concerned with promoting health and well-being through occupation. The primary goal of occupational therapy is to enable people to participate in the activities of everyday life”. At present, majority of Filipino occupational therapists (OT) are involved in pediatric practice, with clients that include children with physical and psychosocial disabilities, such as cerebral palsy and autism spectrum disorder (ASD). The goal of an OT is to educate and guide clients in acquiring or rehabilitating the skills necessary for self-care activities (e.g. feeding, bathing, dressing), education, work, play/leisure, social participation, and other necessary life skills (e.g. buying from a store, using public transportation). Common approaches OTs use in order to ensure maximum function include behavior management techniques, sensory integration activities, cognitive-behavioral approaches and developmental skills training. •Aquatherapy. The beauty of aquatherapy is that it chooses no one. Clients across all ages and various types of conditions have gained several benefits from simply being in the water. More so for children because swimming in a pool filled with toys can be an exciting and rewarding experience for them. 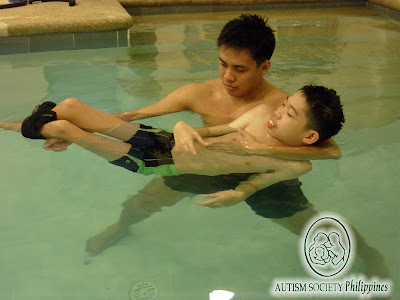 Aquatherapy is recognized as a widely used treatment for children with cerebral palsy. The physical properties of water are used to allow for improved performance of exercises and different movements that would not usually be possible on land. With each new posture or movement clients accomplish, self-image and self-esteem are also improved, in addition to several motor gains. Commonly used aquatherapy methods in the country include the Bad Ragaz Ring Method, the Halliwick Method, and Watsu (Water Shiatsu). These methods are all capable of improving strength, flexibility or reducing spasticity in children with cerebral palsy or adults with stroke. Jilliana, a child with global developmental delay, experienced difficulties in holding her head, rolling over, crawling, sitting and walking. She initially demonstrated poor work behaviors and a short attention span during activities. She was also very resistant to instructions given by her therapists and would cry throughout the session. After months of receiving aquatherapy, her family and developmental pediatrician began to note positive results. Crying has decreased as she has learned to enjoy her sessions, and she has become more exploratory, open and active in activities both within the pool and in her home environment. Her mom proclaimed that the skills she gained through aquatherapy shine the most and can be considered as some of her best skills. • Oral-motor therapy. Children with physical and psychosocial disabilities have been found to experience difficulties both in feeding and speech, due to muscle weakness in the oral-motor (OM) area, tactile hypersensitivity around and within the child’s mouth, etc. OTs and speech therapists use tools such as vibrating toothbrushes for proprioceptive stimulation and muscle activation. They can also use bubbles and horns to provide children with actual experiences of creating sounds and using the muscles of the cheeks and tongue in activities such as blowing. Nicolo, a child with autism, was often observed to drool profusely. His shirt, the table, and even the floor would be wet after sitting in one area for a period of time. After undergoing the OM therapy, he had remarkably better oral motor control, his cheeks and lips were strengthened and his drooling eventually ceased. •Multisensory environment. Sensory integration (SI) allows children with sensory processing concerns to develop adaptive responses to stressful or unfamiliar situations. This is by providing them with the sensory experiences they may be avoiding or seeking. The Multi-Sensory Environment (MSE) is a room that is specifically designed to control and adjust the environment to the child’s sensory needs. 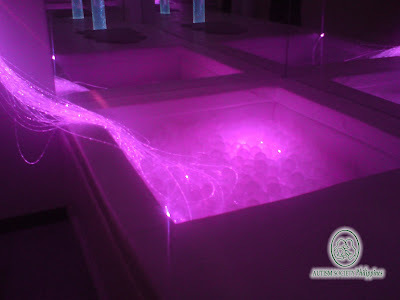 It contains technologically advanced equipment such as light projectors, audio systems, fiber optics, aromatherapy, swings, as well as toys and surfaces of different textures and uses. Nicolo also experienced several sensory processing concerns. His parents found it difficult to bring him to malls and gatherings, and he did not feel comfortable going almost anywhere. During his first OT-MSE session, he stayed by the door the whole time. After a few minutes, he would take a few steps inside and would look at things more avidly and even attempt to touch things. As he progressed, he learned to explore and be more at ease with his environment. The feeling of security and safety in this environment allowed him to cope and adapt better to his sensory processing difficulties. At present, he accompanies his parents almost anywhere, and he is more comfortable learning and exploring his surroundings. •TheraSuit. The TheraSuit is a soft, dynamic orthotic that was designed by PTs Richard and Izabela Koscielny, in 2001. It is meant to provide adequate vestibular and proprioceptive input to children with motor difficulties. Such inputs are for decreasing inappropriate postures and pathological reflexes, and allowing them to experience appropriate movement patterns. Kiss is a child with cerebral palsy hemiplegia. According to her mother, the best thing Kiss benefited from the TheraSuit is that she is able to maintain a cross-sitting position without any difficulties. She also demonstrated improved behaviors, such as increased patience during therapy sessions. Financial concerns are among the top reasons children decide to drop-out of therapy programs or fail to receive therapy services as early as possible. According to the Department of Education, the universal estimate of children with special needs reaches a total of 5.5 million, and only close to 160,000 received special education services from schools in 2005. Given that a significant number of these children also belong to families who live below the poverty line, it can be expected that even less are able to afford quality services, such as occupational, speech or physical therapy. As a response to the growing need for excellent yet affordable therapy services, Quality Life Discoveries, Inc. has recently launched TheraPinoy: Gawad Therapy para sa Batang Pinoy. Funded through the kindness of Tasco, Inc. and Spira Sales Corporation, the center will be providing scholarship grants, initially to deserving children with physical disabilities to help them achieve maximum quality of life; empower and provide hope to their families; and contribute to society as a whole by increasing awareness and hopefully inspiring more initiatives for such programs.